This digital document is an article from Reason, published by Reason Foundation on October 1, 2010. The length of the article is 1395 words. The page length shown above is based on a typical 300-word page. The article is delivered in HTML format and is available immediately after purchase. You can view it with any web browser. There are over 70,000 apps on the Android Marketplace. If you are new to Android (or even old), then chances are you have missed a few. 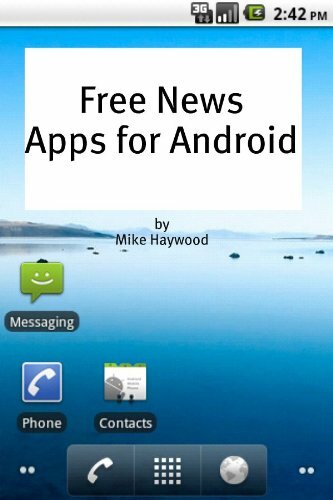 This book compiles summaries of several of the most popular apps in this category, to help you decide which app you need for your phone. All of the apps in this book are free. While there are a handful of "lite" apps, most of the apps are full featured. Finally! Someone has written a fact based book about the economic engine of America.Both of these authors undertook this endeavor due to the poor teaching and erroneous information their children were getting at some of our finest universities.They decided to gather the FACTS and share them with the rest of us laypeople.Written in a way the average business person could relate to, this book gave me the hope that America was not "dead" and the great evil we are made out to be.It covers a wide range of topics that will help you educate your peers with the "reality" of the world's issues.I have purchased 10 of these books to give to my friends as a 'must read". The right way to think about anything is through critical analysis and reasoning. The authors of Reality Check have taken that approach, and it is an excellent read. By focusing on facts rather than perceptions, and weighing ideas against each other, they have provided a refreshing contrast to conventional thinking and misconceptions regarding the important political, economic and social issues of the day. America has its challenges, and things are obviously worse than when the book was published earlier this year, but it remains the best place on earth in terms of freedom andpolitical/economic opportunity, as the authors clearly show. If nothing else, this book will expand your thinking and worldview about important issues, while providing a refreshing contrast to media distortions. I highly recommend it. In a time when the availability of an unprecedented number of sources does not assure accuracy of information, this fully documented and comprehensive coverage of the key issues bearing upon the state of our Union, fills a crying need. The quality, timeliness and pertinence of this report makes it a must read for all who seek to cut through the morass of politically biased reporting. You really owe it to yourself to read this book before you choose your candidates this fall. 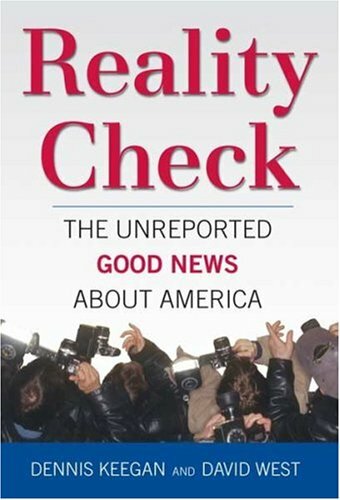 Reality Check is a very important book for everyone in this country to read.It does a thorough job of counterbalancing the mythes and lies that are so commonly put forward daily in the news. As well,it is informational and easily readable for anyone who wants to understand basic economics and how they relate to our personal world.Reality Check is definitely worth the time it takes to read! Would have been nice if I'd ever gotten it. I'm 4.5 weeks after ordering it and never got it.The class I bought it for is over next week. This digital document is an article from American Journalism Review, published by University of Maryland on June 1, 1997. The length of the article is 907 words. The page length shown above is based on a typical 300-word page. The article is delivered in HTML format and is available in your Amazon.com Digital Locker immediately after purchase. You can view it with any web browser. From the supplier: Metro Video News (MVN) is offering round-the-clock, seven-days-a-week coverage of ordinary news events to television news stations. This service provides video tape without reporters' narration. MVN began in Houston, TX in 1995 and plans to expand into several other large-city markets by the end of 1997. MVN executives feel their service would allow broadcast stations to focus resources on the most significant stories. Title: Covering the routine for TV stations. William Morris is best known for his involvement in the Pre-Raphaelite movement and as one of the greatest European pattern-designers since the Middle Ages.He was also a campaigning socialist, a pioneering environmentalist, and a lyric poet, as well as a journalist and a storyteller with a penchant for making his dreams reality.Much of his prose writings focused on the theme of an earthly paradise, which is the subject of "News from Nowhere. "First published in serial form in the "Commonweal" in 1890, this novella offers Morris' ideal future for England as a pastoral society born out of revolution.A true utopian vision of the future, it is largely forgotten in comparison to the dramatic dystopian works such as "Brave New World" and "Nineteen Eighty-Four," which have dominated the interest of scholars and students. 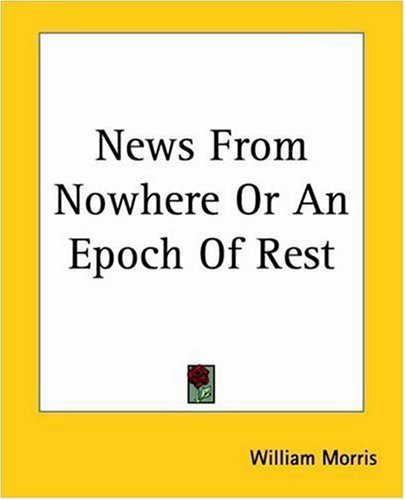 "News from Nowhere, or, An Epoch of Rest: being some chapters from a Utopian Romance" tells the story of a young Englishman who goes to bed one night in his London home and wakes up in a strange world where his "neighbors" talk about the year 2001 as thought it had happened in the past.Morris depicts an England where radical changes have altered not only the way things look but the key elements of the society, which is now structured according to the ideals of communism.This means a world without money or private property but with a perfect equality between all citizens who share in the daily labor. In addition to these common features of a utopian society, Morris argues that labor would be regarded as a pleasure rather than as a chore.This is possible because in the ideal world Morris envisions every citizen does the job that matches their skills and is able to take pride in the fruit of their labors.Consequently, for Morris "work" is more akin to "art," specifically in terms of the Medieval idea of individual workmanship, where even the production of a dish was celebrated as an art form.Towards this end Morris creates a future where humanity has eliminated all but the simplest forms of machinery, forcing a reliance on the individual skins of the workman.Even the city of London becomes a collection of villages in this post-industrial utopia. At one point an old man who had studied the revolution explains what happened, which is where "News from Nowhere" gives Morris the opportunity to comment on the injustices he perceives in his own society.The revolution came when the conflict between workers and the state became violent.Unions had banded together in larger organizations and when the establishment ordered unarmed protesters to be gunned down and the workers decided to fight back.In many ways the story Morris tells through his character clearly predicts some of the conflicts that would take place between labor and the state around the world in the decades to come, but there is also a strong affinity with the story of the French Revolution. To succeed in foreign policy, U.S. presidents have to sell their versions or framings of political events to the news media and to the public. But since the end of the Cold War, journalists have increasingly resisted presidential views, even offering their own spin on events. What, then, determines whether the media will accept or reject the White House perspective? And what consequences does this new media environment have for policymaking and public opinion? 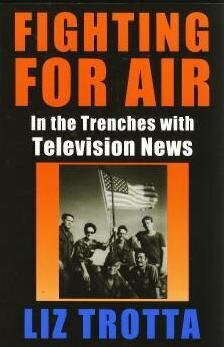 To answer these questions, Robert M. Entman develops a powerful new model of how media framing works—a model that allows him to explain why the media cheered American victories over small-time dictators in Grenada and Panama but barely noticed the success of far more difficult missions in Haiti and Kosovo. Discussing the practical implications of his model, Entman also suggests ways to more effectively encourage the exchange of ideas between the government and the media and between the media and the public. 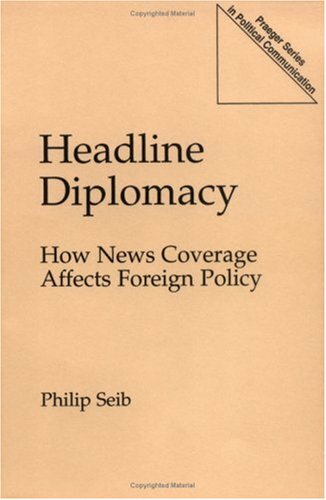 His book will be an essential guide for political scientists, students of the media, and anyone interested in the increasingly influential role of the media in foreign policy. 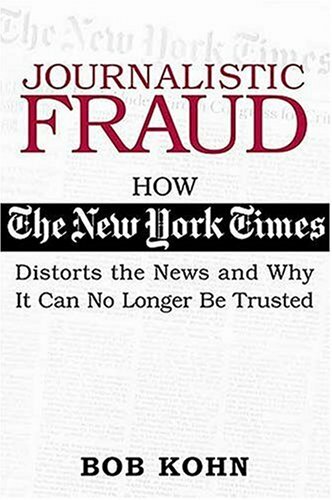 This treatise on the news will be essential to anyone who is starved for actual knowledgeable analysis of the way the media interacts with the public and with politicians, and who are tired of ignorant and whiny conspiracy theories about liberal (or for that matter, conservative) media. Here Entman builds upon existing theoretical work in mass communications and political science, and advances a reasonably convincingly new model called "cascading activation" to define the media's impact on foreign policy operations. In the process, Entman also supplies some enlightening historical research on rarely-considered events, like the Soviets shooting down a Korean passenger plane in 1983 and the completely different media response to a similar 1988 event in which the Americans shot down an Iranian passenger plane, plus in-depth research into how the American media presented small-scale 1980s military operations in Grenada, Libya, and Panama. Then, of course, there are the matters of 9/11 and the Iraq War, in which the behavior of the media has been far more complex, and less directionally skewed, than pundits would have you believe. 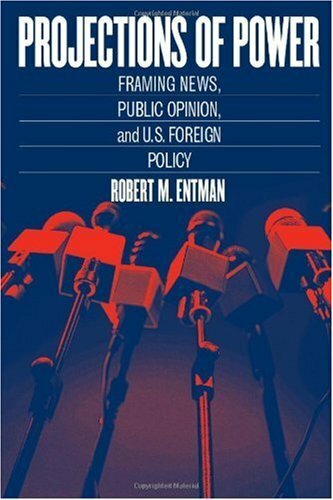 "Projections of Power" by Robert M. Entman is a scholarly analysis of the media and U.S. foreign policy. Mr. Entman discusses the media's changing role as a critically important intermediator between power, politics and the public. 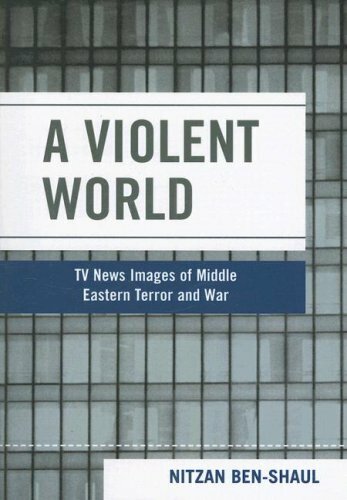 Through a comparative examination of media reporting about several memorable events that occurred both during and after the Cold War, Mr. Entman offers both a penetrating critique of changing media practices and suggests a number of ways that the media might reform for the better. Mr. Entman proposes an original theory for understanding media power. The author's "cascading activation" model explains how issues are passed down from the White House to elites, news organizations, and the public, as well as how pushback can be activated from lower levels to the top. Mr. Entman explains the importance of framing issues but contends that promoting a particular political objective has become increasingly difficult with the demise of the Cold War. For example, Mr. Entman cites a paradigmatic case where the U.S. and USSR each mistakenly shot down passenger planes in the 1980s; as might be expected, Mr. Entman discovers that the media treated the U.S. incident as a tragic error whereas the USSR was overwhelmingly condemned for an apparent act of evil. Clearly, the media's reporting of events was shaped by the dominant Cold War cultural schema of a public that predominantly believed in a well-intentioned U.S. versus a systemically corrupt USSR. 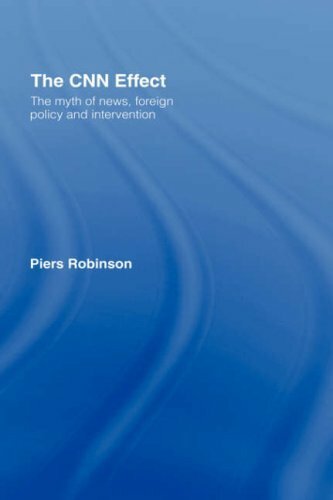 Today however, the author contends that the current Iraq War offers evidence that a more sophisticated Internet-enabled public and media can offer at least some critique of the administration's policies at least some of the time. However, Mr. Entman offers a sober assessment of the seemingly insignificant role that public opinion plays in influencing foreign policy. Mr. Entman discusses how the Reagan administration manipulated the media to influence public opinion in favor of increased defense spending but did not reduce these expenditures when opinion later swung towards increasing domestic programs. In fact, Mr. Entman shows that political leaders are more concerned about spinning news events to achieve the desired outcome than with fact, concluding that in practice democracy is all but limited to voting. Therefore, Mr. Entman believes that the media would do well to safeguard the public interest by creating "liaison editors" who might be able to better analyze news and construct challenges to administration spin, as well as to have "designated statesmen" available who could articulate opinion on policy matters. The author hopes that these kinds of mechanisms might help to activate resistance to poor policy choices by enlarging the scope of debate within the media. I highly recommend this interesting and highly readable book to everyone interested in media, politics and democracy. 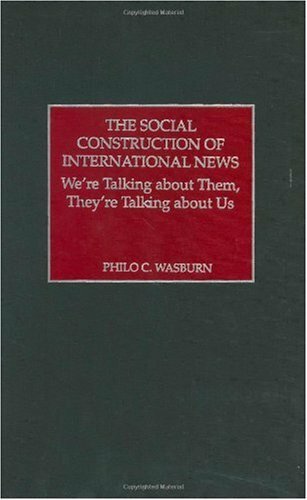 Robert Entman, Professor of communication and political science at North Carolina State University, has produced a fascinating study of the US media, which is applicable to Britain's media too. Their ruling assumption is that the US state is innocent and benign. In Chapter Two, he compares the media handling of two similar events: Korean Air Lines 007, shot down by a Soviet jet in 1983, and Iran Air Flight 655, shot down by a US ship in 1988. The first was judged as a murderous attack, `wanton, brutal and deliberate', proof of Soviet moral bankruptcy, portrayed with pictures of the dead and much empathy, outrage and generalisation. The second was seen as a tragic accident, `understandable, mistaken and justified', a technical glitch, described in the passive voice, in abstract language, with no pictures, no generalisation and no blame. In Chapter Three, Entman looks at the media treatment of the US attacks on Grenada, Libya and Panama. The media presented coherently only the administration's view. Typically, CBS's anchor Dan Rather said they were "not sure exactly what was happening but knowing the teams. It was the US against Qaddafi". Entman concludes, "The analysis demonstrates how journalists served as more or less loyal conduits of U.S. government propaganda in wartime." It seems that the first rule of the US state's news management is `lie early and lie often'. In Chapter Four, Entman examines the media's `great debate' about the war on Iraq, which, it appears, was between those who wanted war at once and those who wanted war later. 71% of the Americans who appeared on camera were pro-war, just 3% against. Entman shows how the state portrays the enemy as a threat, then uses a brief `wave of patriotism' to rubbish dissent. The state pretends that it is responding to public opinion, and claims that the media reflect public opinion: both notions support the ruling pretence that the public governs. In Chapter Six, Entman disproves all these myths by showing how the US state, with media assistance, beat back the hugely popular movement for a nuclear freeze. "Caution: You’re about to enter a no-spin zone" is the warning with which Fox News Channel’s Bill O’Reilly kicks off his no-holds-barred cable news program The O’Reilly Factor every night. O’Reilly is the reigning king of cable news, with a huge lead in the ratings, two best-selling books, and a nationally syndicated radio program. O’Reilly’s "no-spin" motto is clever marketing—but who’s keeping track of O’Reilly’s own spin? From his support for Bush’s tax cuts and the war with Iraq to his attacks on everything from National Public Radio to "welfare mothers," O’Reilly often contradicts himself and consistently concocts evidence to support his conservative talking points. His misguided opinions, stated as facts, are often simply wrong, such as his claim that the U.S. "gives far and away more tax money to foreign countries than anyone else . . . Nobody else even comes close to us" (per capita the U.S. is near the bottom of the list for developed countries). Other of his statements are deliberately inflammatory, such as his suggestion that we bomb Libyan civilians in the aftermath of September 11 ("Let them eat sand"). Weeks later O’Reilly denied the sentiment, though he has publicly stated that "If you’re not providing controversy and excitement, people won’t listen or watch." Following in the footsteps of FAIR’s hit book The Way Things Aren’t: Rush Limbaugh’s Reign of Error, The Oh Really? Factor will use facts, humor, illustrations, and comics to challenge the many absurd, outlandish, and just plain incorrect statements made on one of the U.S.’s most-watched "news" programs. Publication timed to coincide with O’Reilly’s forthcoming book, Who’s Looking Out For You. Peter Hart is the activism director at FAIR (Fairness & Accuracy In Reporting), the national media watch group. He is also a co-host and producer of FAIR’s syndicated weekly radio show CounterSpin. ill bet all of you that damn o reilly are democrats---far left wing liberals that are intent on destroying this country--am i right?are you democrats(dummycrats?) --guess ONLY the dummycrats(progressives) answered the review---WHERE are you republicans?!! !AND independants?back me here! OReilly and FOX are evil. -Good expose about one of the most appalling and insidious creatures in the mass-moron media today and the twisted, right-wing masquerading as centrist network he lies for. Anyone left of Attilla the Hun is "far-left, lunatic fringe" in their view. Since The Factor (and Fox News) has dominated the cable news ratings (even if you combine CNN, MSN, etc. together) for years, people will always try to make money by targeting the top show.O'Reilly always puts up the "commentary" title (unlike the mainstream media and other cable news networks, i.e., 75% of Americans believe the media slanted their coverage of the recent election to support President-Elect Obama) when puting forth his personal opinion, and if you watch the show he takes on both sides of the issue while still advocating the ethics and values that made the United States a good force in the world.I bought this to see if I was missing something; however, it served to just support my analysis that his show, overall, The Factor is outstanding. This is a terrific book. O'Reilly is a prominent "journalist" whose views are taken seriously by millions of people. Hart shows--repetitively--that O'Reilly is extremely dishonest. I urge any Factor fans who see this review to read Oh, Really. Maybe you'll switch to CNN--OK, I'm being optimistic. No one who reads this book with an open mind can pretend O'Reilly is speaking truth to power. One thing that Bill O'Reilly always tells his viewer is to read the left, right and in between stuff...so I try to that, but books like this give me a stomach ache. Since I have actually seen the shows Peter Hart drew his quotes from, I know they were often taken out of context or just not what O'Reilly said at all. I don't always agree with O'Reilly, but I would rather have him "Looking out for me" than any politician or other pundit. I often go back and check facts that he has presented,and he is usually right.If he's not, he'll come back the next day and apologize, then give the correct information. This writer needs to learn what "Fairness" actually means, because he didn't give any of it to O'Reilly.But I guess it's easy to take pot shots at the people at the top. I just really feel insulted that he thought he could pass this off as true information to people who actually watch the show...and just because an organization is called "Fairness & Accuracy in Reporting" doesn't mean that they don't have their own agenda or are not right out lying.This is the same man who has said that O'Reilly is a racist and that is totally untrue. 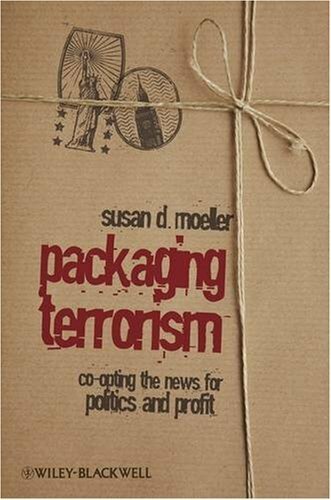 Packaging Terrorism investigates how American media have identified and covered international terrorism and violence since September 11, 2001. It's funny how, by virtue of controlling the media and having the pacifist Euro crowd love you, a lying hypocrite with an agenda can win the Nobel "Peace" Prize, and poor Bob Kohn, with his meticulous research and a VERY noble cause, gets little notice. Welcome to the Orwellian World of 2007. My father grew up pouring through "The Grey Lady" each day. Like most of his friends, liberal or conservative, he stopped reading this rag a few years back. He didn't need news stories turned into anti-american op-eds by a clever staff of New School alumni lunatics who place, omit, add, and throw in subjective words wherever they find fit, simply to please their left wing elite establishment. Is it any wonder the Muslim Jihadists quote from the NY Crimes? Was the fact that their former ombudsman confirmed an inherent lefty bias not enough? Was the firing of affirmative action reporters who made up stories in their apartment not enough? What else? This paper has less credibility than any of your local weekly fish wraps. Sadly though, since most city papers get their international stories from the Times, and Starbucks and every public or collegiate library has a subscription, these Marxists are still sailing along arrogantly, giving away national security secrets, burying pro-american stories, leading with stories about the "poor Muslims," etc. They are the worst. And looking at the reviews of Kohn's book, you can tell these vapid, negative reviewers did not read it. If they did, they'd never be able to stomach opening that blue bag ever again. Instead, they ignore and spew hatred. A typical quality of leftists. It has become more and more transparent that the New York Times leans not only left, but far enough away from mainstream America so as to reach out to our enemies in the War on Terror. To then defend themselves,arrogantly acting as if Americans are out of line for doubting their intentions, displays a sort of elitism that is unparalleled even in the long history of "the Grey Lady." With The Times "above the law" mentality, it is noteworthy to look at some of their treasonous publications within the War on Terror. In the world of the Times, anything that makes the American military look juvenile or ruthless makes good copy. The Guantanamo Bay ordeal has been a favorite of theirs for some time. In this long--winded diatribe, the editorial staff laments that so many Gitmo prisoners were never charged with crimes, discusses their despair and blames President Bush for creating this "netherworld." Two years ago, for the entire month of May, the Times ran at least one story per day, demeaning our troops and federal government for the way the Abu Ghraib prison was run. Each article is linked. Phyllis Chesler's piece entitled, "When you can't say Muslim!" discusses a Times piece (one of many, no doubt) in which the writers tiptoe around sounding politically incorrect and culturally insensitive, refusing to label the terrorists as Arabs or Muslims, much less radical extremists. James Bennet pleads with the Times to cease labeling our mass--murdering enemies "insurgents" and define them properly. Christoper Hitchens also helps makes sense of the Times"multicultural" madness. Needless to say, more than a year later, the Times and the media in general have not acquiesced. 6. "NY Times Blows Cover of Key Counter Terror Agent" (August, 2004). As reported above by Newsmax. Enough said. A little more than three months before his death, the Times' Greg Myre, like Jimmy Carter and too many others, was still lauding the "Palestinian" leader. Although the article is not a hagiography, it does not condemn Arafat, discusses his longevity, and notes, among much else, that "he remains the enduring symbol of Palestinian aspirations to full nationhood." The National Review's Tom Gross discusses at length how the Times picks and chooses which deaths and destructive activities to report and photograph more often, and with more (or less) coverage. He also debunks the oudated myths that the paper is "pro--Israel." Jason Maoz of the Jewish Press, writing for Front Page Magazine, discusses many of the same mistaken priorities that Gross did two years prior. However, Maoz goes further, discussing the word structure of certain headlines and how they can obfuscate the matters at hand. He concludes by noting the Times' unflappable concerns over dead "Palestinians." Is that really Pro--Israel? Daniel Okrent, the former ombudsman of the paper, delicately explains how the Times leans left. He naturally stops short of saying anything insidious, and in a May 2006 interview I heard with him on National Public Radio, he recanted much of this saying he regretted the first few words of his piece: "Of course it is." David Limbaugh's most recent piece featuring the Times' most recent (and perhaps most deplorable) anti--american actions. Limbaugh explains the legal ramifications of the paper's disclosure of secure information, notes the Times' responses and elaborates on the long--term effects on this story. Basically, as you can especially deduce from the recent pieces that harass the Bush Administration, aid our enemies, and betray America's trust, the Times shows the hypocritical propensity to clamor for certain checks and balances on the executive branch, yet turn a silent ear toward those same checks upon the legislative, judicial and, of course, themselves. That, along with their recalcitrance to call the enemy by name and denounce his actions, explains why so many Americans no longer trust the Times as a viable source of news. As anyone who watches Scarborough Country on MSNBC can tell you, this man has zero credibility. He regularly gets caught on air lying and making up and distorting facts. He is also prone to outrageous temper tantrums that would make the most ill-behaved child embarrassed to watch. Based on the man's questionable character, the chances aren't very good that this book has any sort of factual basis whatsoever. There is a reason this book is selling for thrity-two cents. I could not get further than a quarter through this book -- but one doesn't need to eat a whole rotten apple to know it's bad. This author started out with a premise he wanted to prove, then cherry-picked facts out of context to "prove" them. This is sloppy logic that isn't even clever enough to disguise its brazen right wing agenda to "discredit" legitmate journalism. As Stephen Colbert said, "reality has a well-known liberal bias". Ordinarily it might be suggested that these kinds of poorly written, biased books are corrosive to the democratic foundation of our country, were it not for the fact that it isn't even very good at what it attempts to do. This book is likely to appeal only to those already converted to radical right wing conservatism. For those of us still prefering to live in fact-based reality: run. I'm sorry - this guy has an ax to grind - that's what it comes down to, end of story. Also, fault it too, for being incredibly, annoyingly repetitive. Mr. Kohn, hey you tried, but you didn't make your case. Your agenda is what shines through more than any compelling logic. The NY Times remains the paper of record, while you, sir, remain a has been, sorry, make that "never was" and a partisan hack. Avoid this poor excuse to fell trees at all costs and do something productive instead. The interesting thing about this book is that its' meticulously researched, but poorly written and annoyingly repetitive. Kohn is not a journalistor a college professor, but simply a "concerned reader" with a vendetta against NYT editors and current Times publisher for "ruining" his paper. We live in a dangerous world. Numerous hazards can strike us down from infectious diseases and genetic disorders to food poisoning and car crashes. Furthermore, the advances in information technology enable consumers to be more aware of these problems as the latest data on new hazards is spun around the world in a matter of seconds. 1. Hazards are as likely to come from natural as from man-made substances. 2. The linear no-threshold hypothesis is rubbish (i.e. the dose makes the poison). 3. An entire industry has developed to scare us into stopping certain activities, or making us feel guilty for continuing them, or lobbying to have them banned by government. 4. The public are quite capable of making decisions that involve complex trade-offs if only we would let them; indeed not letting them causes enormous problems as government bodies do not have the dispersed knowledge to do this, and are subject to interest group pressure. 5. There are innumerable benefits, as well as costs, from risk taking. 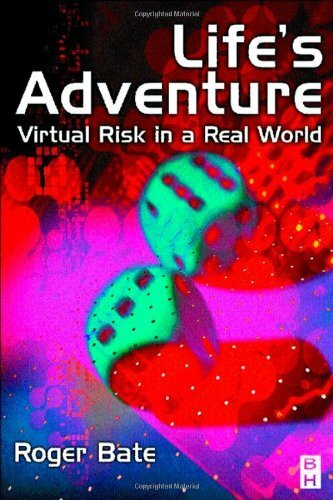 Most articles concerning risk avoid mentioning any of the above five themes. 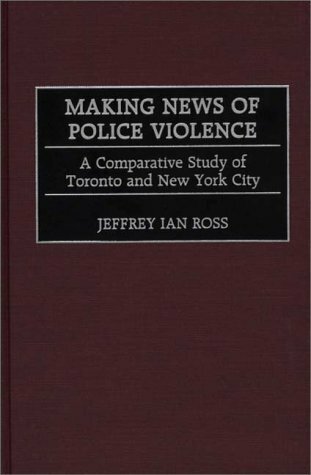 The articles for this book were originally published in the Wall Street Journal, Financial Times, Economic Affairs, and The Sunday Times. An introduction will draw all the articles together. Up to date discussion of current issues and scientific controversies.